Just like you should exercise every day, so should your bunny! Exercise time can be a wonderful bonding opportunity where you can play with your bunny. Your rabbit will also benefit by playing alone and you can encourage her by giving her an exercise space that is interesting and stimulating. It doesn't have to be very large, one room is sufficient. After your rabbit becomes comfortable and familliar with the room, it is possible to allow him to explore more areas of your home. Once you know where you are going to allow your bunny to roam free, make sure the area is bunny proofed. Keeping electrical cords out of reach and making sure there are no small objects available that your rabbit can nibble on or swallow. Rabbits need exercise equipment too; ramps to run on, buckets of hay to jump in and boxes to climb on are great fun. Cardboard tubes, large enough for your rabbit to run through will make great rabbit tunnels. Toys, both chew toys and toss/nudge toys, can be added to this environment. Having something extra to chew on and dig is also a good idea and an old phone book will do the trick! Be sure to always have a litter box in their play area, just in case. An outdoor area is also very nice, but takes extra consideration. 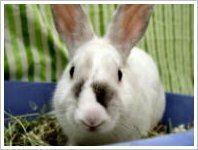 Predators, toxic plants, pesticides and moving vehicles can all be deadly to your bunny. If you are going to have outside playtime, please plan wisely. A large covered playpen can be built with straw strewn across the floor. An enclosed porch or balcony can also serve as a good outdoor area. Please remember that outdoor time must always be supervised.